Fill in this last page of questions to get your free quotes! Gastric sleeve surgery, or a sleeve gastrectomy, is a procedure in which up to 75% of your stomach is removed to leave a much smaller 'sleeve'. Having this smaller stomach limits the amount of food you can eat, helping you to lose weight. When combined with a balanced diet and regular exercise, you can expect to lose up to 70% of your excess body weight with a gastric sleeve. Gastric sleeve surgery costs between £7,995 and £10,300 at a private clinic in the UK. If you do not have the money to pay for the procedure in one lump sum, many clinics provide financial assistance to make the surgery more affordable. A gastric sleeve (or sleeve gastrectomy) is a surgery that aims to help those overweight people to lose weight. It works by reducing the size of your stomach by up to 75% to leave a small, banana-shaped ‘sleeve’. This restricts the amount of food that can enter your stomach, making you feel full more quickly. This means that you feel satisfied when eating smaller meals, so it is an effective way to control your portion size. Gastric sleeve surgery is an increasingly popular surgical option for individuals looking to lose weight that they’ve struggled to shift through dieting and exercise alone. Those with a gastric sleeve can expect to lose up to 70% of their excess body weight, when combined with a healthy diet and regular exercise. 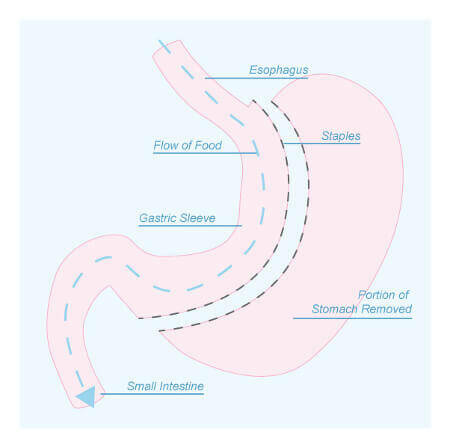 A gastric sleeve is a non-reversible operation meaning that your stomach will remain a smaller size forever. This helps you to maintain weight loss over a long period of time. Because it makes a permanent change to the size of your stomach however, gastric sleeve surgery is often performed as a last resort on individuals who are severely overweight. Gastric sleeve surgery is only recommended to extremely overweight individuals who have repeatedly failed to lose weight through adopting a healthier lifestyle. If you’ve struggled to achieve weight loss through changes to your diet and exercise regime, a gastric sleeve could therefore be the right choice for you. You will also need to prove that you are committed to making permanent changes to your lifestyle after the operation has been performed. You must also be fit and healthy enough to have the surgery under general anaesthetic. Please bear in mind that the eligibility criteria for gastric sleeve surgery varies from clinic to clinic. You will not need a referral from your GP however. To find out if you are a suitable candidate for the treatment, you should book a consultation with a surgeon at a clinic of your choice. By filling out the form at the top of this page, we can put you in touch with the best weight loss clinics in your area. You should expect to pay anywhere from just £7,995 to over £10,000 for gastric sleeve surgery at a private clinic in the UK. Gastric sleeve surgery tends to cost more than other types of weight loss surgery (e.g. gastric balloon surgery) because the procedure is more complex to perform. Don’t let the price put you off however – for some, gastric sleeve surgery is often the best type of weight loss surgery in terms of the long-term weight loss results it can achieve. Please be aware that the exact cost of a sleeve gastrectomy is determined on a case by case basis. Do not be alarmed therefore if the price you are quoted varies wildly from the price advertised by a clinic – these are only intended to be a guide price! Clinics understand that not everyone has the money to be able to pay for gastric sleeve surgery in one lump sum. They therefore offer a range of finance options to help you to pay for the procedure. This means that you do not have to put your weight loss surgery journey on hold until your savings have grown! Most finance options require you to pay a deposit to book the day of your surgery. This can be a fixed sum of money, or a percentage of the total cost of your surgery. You’ll then be required to make a small payment each month until you have paid back the remainder of the money you owe. This is typically over 12, 24, 36 or 48 months. Be aware that you’ll likely be charged interest on these payments, although interest-free finance options are sometimes available. If you’re considering paying for gastric sleeve surgery on finance, you should book a consultation with a weight loss clinic. They can chat to you about the financial support that they provide and help you to decide which option is best for you. Since consultations are often free, this means that you can visit several clinics and compare the finance deals offered at each one. Suitable for Weight Loss Surgery? Click your age below to find out! You will first need to have a consultation with a surgeon and dietician. They will ask you questions about your health and lifestyle, as well as carry out some medical tests to determine your suitability for gastric sleeve surgery. You may also have to undergo a psychological assessment. A few weeks before the day of your gastric sleeve surgery you will be invited to a pre-operative assessment in which you will have a series of health tests to make sure that you are fit enough for the operation. This can include blood tests, x-rays and an ECG. You will need to stop drinking and smoking. Doing this will reduce your risk of developing serious complications during the surgery (e.g. blood clots and infection). In the two weeks prior to a sleeve gastrectomy, you’ll be put on a strict healthy eating and exercise plan. This will ensure that you are in the best possible health for your operation. It will also shrink the size of your liver, making it easier for the surgeon to access your stomach during the procedure. You may be advised to stop drinking caffeine and fizzy drinks a few days before the surgery. On the day of the operation, you’ll need to fast for at least six hours to ensure your stomach is empty when the sleeve gastrectomy is performed. A sleeve gastrectomy procedure is performed under general anaesthetic, so you’ll be asleep throughout. It takes between 2 and 4 hours to complete. Using the keyhole technique, your surgeon will make approximately 5 small incisions (cuts) in your abdomen. Through these incisions, they’ll insert a number of surgical instruments including a tube with a small camera (a laparoscope). Your surgeon will then remove part up to 75% of your stomach to create a much smaller banana-shaped pouch or sleeve. This will be sealed using staples. The incisions made on your abdomen will be closed and you’ll be taken to a recovery room until you wake up. Your abdomen is likely to be bruised and sore, but you’ll be provided with painkillers to ease the discomfort. Your healthcare team will carefully monitor your health (e.g. blood pressure) to ensure that the operation was successful and your recovery normal. You might have small tubes inserted into your abdominal incisions to drain away any excess fluid, as well as a catheter to empty your bladder. Once you feel well enough to, you’ll be encouraged to get up and move around to stimulate your blood flow and reduce the risk of blood clots. This can also help to reduce any pain that you might be feeling. You’ll need to stay in hospital for roughly 3 to 5 days before you’ll be discharged and allowed to go home. During this time, you’ll be put on a strict liquid diet whilst your body gets used to your new stomach. On your departure from hospital, you won’t be able to drive so you’ll need to arrange an alternative mode of transport. Your surgeon will give you a set of aftercare instructions which will advise you on what to do once you are home. You need time to recover following gastric sleeve surgery, so you must get plenty of rest. The exact recovery time varies from person to person, but most people are able to resume their normal activities within two weeks of the operation. Most patients continue to feel some pain in their abdominal area for up to 4 weeks after the surgery, particularly when moving around. You’ll be given painkillers to take to ease this discomfort. Although you will feel tired, you’ll need to gradually build-up the amount of time you spend exercising each day. You should begin with some light walking and increase this to gentle jogging and aerobic exercise. However, you should not adopt a rigorous exercise regime until at least six months after your sleeve gastrectomy. You’ll be put on a strict diet plan following your gastric sleeve surgery to allow your body to adjust to your new stomach and avoid any unpleasant side effects (e.g. vomiting). Initially, you must only consume liquids, before moving onto puréed foods and then solid foods. Most people begin to eat solid foods again by week six. You’ll be required to attend meetings with your dietician who will closely monitor your diet and provide you with advice about what to eat. With a gastric sleeve, you can expect to lose up to 70% of your excess body weight in the first year. While it may take some time before you see any noticeable weight loss, eating a balanced diet and exercising regularly will help you to successfully lose weight. Like with any operation, gastric sleeve surgery puts you at risk of developing a small number of side effects. Whilst these tend to be relatively common, they shouldn’t be anything to worry about since most side effects from gastric sleeve surgery can easily be treated with over-the-counter medication. There is a very small risk that you could develop some more serious complications as a result of gastric sleeve surgery. These will be explained to you in detail by your surgeon before you undergo the operation. Nutritional deficiencies: about 12% of patients who have gastric sleeve surgery develop nutritional deficiency. This occurs when your body doesn’t absorb enough nutrients from the food you eat. This can lead to a variety of health problems. Symptoms to look out for are fatigue, constipation and lightheadedness. Nutritional deficiency can be treated with the long term use of dietary supplements. Gallstones: these are solid masses of cholesterol that form in the gallbladder. They can cause pain in the abdomen, bloating, nausea and vomiting, and heartburn. Gallstones often don’t need to be treated. If they are causing chronic pain or other health problems (e.g. jaundice) however, you will need to undergo an operation to have your gallbladder removed. Gastric Leakage: this occurs when the contents of your stomach leaks. This usually happens at the staple line where your stomach has been cut and sealed shut during gastric sleeve surgery. Gastric leakage can lead to a serious infection if left untreated. Surgery is required to re-secure the staple line and prevent the leakage. Stricture: a stricture only occurs in approximately 4% of patients who have a sleeve gastrectomy. It refers to when the opening of the stomach becomes inflamed and/or blocked. This stops some or all of the food that you eat from entering your stomach. Symptoms of strictures include nausea and vomiting, problems swallowing and food intolerance. Treatment will depend on how long you have had a stricture for, but can be surgery in extreme cases. Unfortunately, some of these complications can occur following gastric sleeve surgery even if you follow the post-operative instructions given to you by your surgeon. Should you experience any symptoms that concern you following your surgery, you should make contact with a healthcare professional immediately. This can be your surgeon, your GP, NHS 111 or your local A&E. "Side effects following a sleeve gastrectomy very low indeed. As long as there wasn’t a problem at the initial operation such as a bleed or a leak, a sleeve is probably one of the easiest operations to live with. Patients can eat almost any food but obviously in a smaller portion. They often don’t feel hungry following the sleeve because the parts of the stomach that’s removed removes what’s called the Gherlin Secreting Cells, the Gherlins are hormones that drive appetite and it’s made in the part of the stomach that is removed following a sleeve gastrectomy." Are There Any Alternatives To Gastric Sleeve Surgery? If you want to lose weight, you should try to make healthier lifestyle choices before considering surgery. This includes things such as exercising frequently and eating a more balanced diet. If you have tried and failed to lose weight through these methods or you are extremely overweight however, then weight loss surgery is a sensible choice for you. Gastric sleeve surgery isn’t the only type of weight loss surgery performed by bariatric surgeons. You may want a less invasive form of surgery, such as a gastric balloon or gastric band. You might also want to consider gastric bypass surgery which also shrinks the size of your stomach, as well as redirecting your small intestine. Your surgeon will talk you through each type of weight loss surgery in your consultation, and will help you to decide which surgery is best for you.